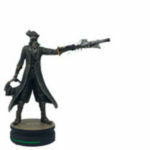 GameStop has opened up pr-orders for a new exclusive collectible. Check out the Bloodborne – the Hunter 1/9 Scale Statue. The new statue is part of the Modern Icons statue line from Chronicle Collectibles. Other characters include Skyrim’s Female Dragonborn, Aloy from Horizon Zero Dawn, Fallout T-60 Power Armor, and numerous new Fallout Statues. The statue is priced at $49.99 with a release set for October 15th. You can pre-order it by Clicking Here. Unfortunately, there is only a very low resolution photo available at this time.